Ah, the indie platformer. It’s a genre that has seemingly been around since the dawn of time. Some of the real standouts from the last decade include the likes of Braid (from the evergreen Jonathan Blow), Cave Story (Daisuke ‘pixel’ Amaya), Spelunky (Derek Yu) and Super Meat Boy (Edmund McMillen and Tommy Refines). Whether focused on puzzles, combat, roguelike permadeath or razor=sharp precision platforming, each is a bona fide Indie darling and an utterly fabulous game in its own right. And no matter your particular persuasion regarding how you prefer your brand of indie thrills, VVVVVV sits proudly in the upper echelons of platforming greats, and walks tall amongst the aforementioned super heavyweights. 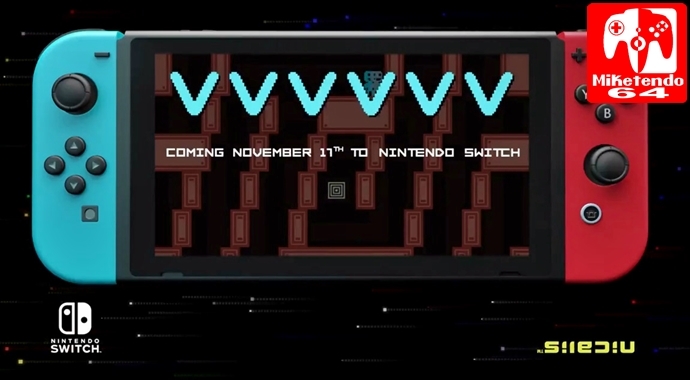 As if that wasn’t enough, it is also worth noting that VVVVVV is published by Nicalis, the guys behind The Binding of Isaac and Cave Story, so there is real credence here. You see, while VVVVVV is a new release for Nintendo Switch, it isn’t a new game. Far from it in fact. Indeed, it was first released on PC just a whisker shy of eight whole years ago now, and as time has gone by, Terry Cavanagh’s seminal hard-as-nails gravity switcheroo has made its way onto pretty much every platform going, from PS4 to iOS, but from a Nintendo perspective, it’s best known on the 3DS where it actually made its eShop debut. And with the help of it’s excellent always present map on the lower screen, it positively shone. The good news for Switch owners is that all these years later, it still does. For the uninitiated, VVVVVV is an excruciatingly difficult 8-bit platformer, where the premise involves switching gravity in order to negotiate (mostly) single-screen spatial awareness puzzles. There is no jump button here you see, not in the literal sense at least. There’s just Left and Right along with a single button to reverse the polarity of gravity from the platform on which you are currently standing, allowing you the super fun ability to run along ceilings. Rounding out the controls, you can also hit either the left or right shoulder bumpers to bring up (and then hide) the map. Easy right? Wrong! I mean sure, the controls are nice and easy enough, but the platforming? With deaths often occurring at a worryingly regular rate that is anything but. Thankfully however, there are no lives to worry about, or game over’s to get in the way, and best of all, save points are placed around pretty much every corner, with restarts almost instant. While it certainly plays second fiddle to the twitchy, yet massively moreish gameplay, there is a story here, too. You control the protagonist, Captain Viridian and are tasked with rescuing six compatriots who were each scattered to different areas of the map following an accident involving your spaceship. Each comrade (whose names also begin with V – hence, VVVVVV) can be saved in the order you wish, so although this is no Metroidvania, there’s even an element of freedom sprinkled into the mix. There are also optional trinkets to be collected if you so wish, but unlike the power moons in game-of-the-moment, Super Mario Odyssey, there are only a handful, with varying levels of platforming prowess (from difficult to downright savage) required to collect each of them. But as we have since come to expect from Terry Cavanagh’s evil genius, when you do manage to pull off the requisite level of unearthly dexterity, it is oh so rewarding. That’s right, this is the very same Terry Cavanagh who made the maddeningly addictive – and twice as tough – Super Hexagon on PC and Mobile. Now if Terry or the powers that be at Nicalis happen to fancy the port, it’s another game that would suit the pick up and play nature of Switch down to the ground. Just sayin’. VVVVVV though, is a far more rounded out package. Besides the main campaign, it also includes a whole bunch of levels made by guest developers. Most of which are expertly crafted and a total blast to best, but perhaps even tougher than the main campaign. If that’s even possible! There’s also a very welcome two-player mode that is exclusive to Nintendo Switch, much like the co-op mode Nicalis added to the Switch edition of Cave Story a few months back, this affords players the chance to play the game with a friend, couch co-op, style. For an eShop asking price of just £8.99 / $9.99, VVVVVV arguably offers the best value for money of any Nicalis game on Switch to date, making for an absolutely essential purchase for all platform fans, indie or otherwise. Sure, at getting on for a decade old now, Terry Cavanagh’s endlessly charming and ridiculously rewarding, 8-bit beauty has certainly been around the block a few times, but it’s now on Nintendo’s latest console, and even to an old hand like myself who has already played it multiple times over, VVVVVV still manages to feel positively daisy fresh. It will drive you up the wall at times, but it’s so damn fun, you’ll love it for doing so and keep coming back for more.